The Invacare® TDX3 SP is the first model in the next generation of TDX (Total Driving eXperience) power wheelchairs. The TDX3 SP takes all the best features of the TDX series and improves upon them with enhanced performance, superior ride quality, quieter chassis, an elegantly simple design. 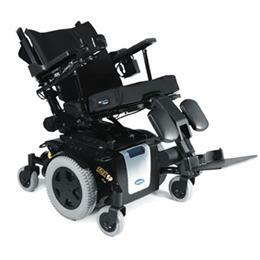 With built-in technologies such as a True Center Wheel drive, Enhanced SureStep, Traction Control Design, Quiet Stability Lock, MK6i Electronics, powerful 4-pole motors, the TDX3 SP is designed to meet the needs of rehab clients who demand performance and style. TDXSP Base is the TDXSP base only configuration that accommodates aftermarket seating options. SureStep suspension combined with TCD™ (Traction Control Design) provides for optimal maneuverability and traction in forward and in reverse, on ramps and outdoors. Configured to maneuver over obstacles up to 3" in the forward direction and 1" in reverse. Seat-to-floor Height: 16.5" - 21"
Overall Height: 34" - 41"
Overall Width: 25" - 26.5"
Turning Radius: 22.1" - 23.6"
Arm Height: ASBA/2GT: 9" - 13", 2GR/GTR: 10" - 16"